As a youth, artist Clinton Hobart was inspired by Disney's The Little Mermaid and it forged his resolve to become an artist, "I remember the specific scene where Ariel comes up out of the water, the wind catches her hair, and it sticks to her face. I remember thinking 'I want to do that for a living.'" By the time Clinton saw Beauty and the Beast he knew for sure it was what he wanted to do. While in high school, he received private drawing lessons from family friend Milt Neil, who worked on many Donald Duck cartoons including Der Fuehrer's Face. Milt had told him to go to the School of Visual Arts in NYC and study figure drawing. "It was just a coincidence that the first drawing I ever did was of Donald Duck, on a napkin, while at a restaurant with my family." While in art school Clinton would spend most of his free time attending life-drawing sessions at Spring Studio. He attributes the character he strives for in his still-life paintings to the years of studying figure drawing. 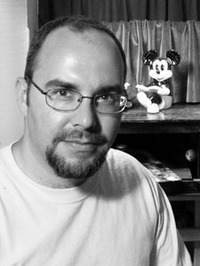 While in his junior year at SVA, Clinton was invited to participate in an internship with Walt Disney Feature Animation known as "Disney Boot Camp" the following year. Clinton has always been a fan of old movies, old music, and acting. 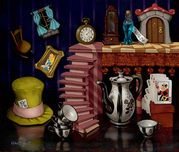 He often imagines that the objects in his still-lifes are actors on a stage. 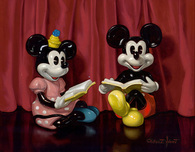 He tries to give each painting a feeling of being "alive," something he learned from Disney movies. 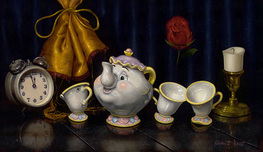 The idea that a clock could talk, a mushroom could dance around, or just the feeling that the objects in a painting might get up and walk away at any second, all came from time spent with Disney. Clinton loves to travel and see new places. He has lived in New York, New Jersey, Arizona, Massachusetts, France, and Florida. "Each painting can take you some place new, just like each Disney movie, and each place you visit can influence the painting you create. France makes me want to paint quaint buildings, Florida makes me want to paint ocean waves, and New Orleans makes me want to paint masks. I think it's important to feel the area and let it influence the work." Clinton's work is currently being shown in many private collections, domestically and internationally. His collectors include CEOs, actors and actresses, several well-known artists, prominent businessmen and women, and government officials. Clinton teaches painting and drawing workshops across the world, and was featured in the February 2009 issue of American Artist Magazine.